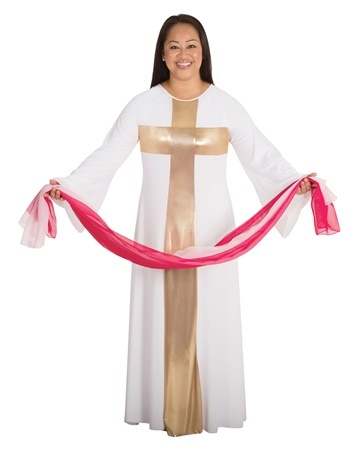 Long dress has slip-over-the-head styling, long semi bell sleeves with hidden elastic wrist band for a perfect sleeve fit, a generously flared body with an ultra full sweep skirt and features a front sewn-in metallic cross. All colors are available for adult sizes. Red and Gold is not available in child sizes. I love the quality of the items I've viewed so far.